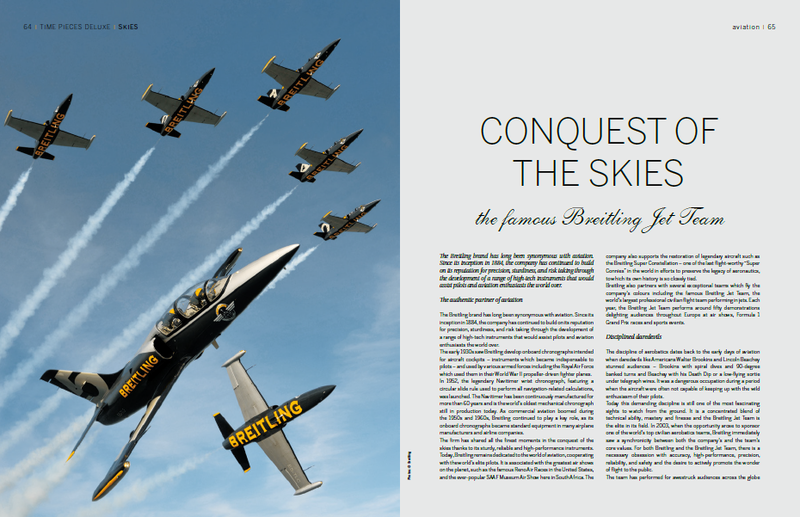 The Breitling brand has long been synonymous with aviation. Since its inception in 1884, the company has continued to build on its reputation for precision, sturdiness, and risk taking through the development of a range of high-tech instruments that would assist pilots and aviation enthusiasts the world over. The early 1930s saw Breitling develop on-board chronographs intended for aircraft cockpits – instruments which became indispensable to pilots – and used by various armed forces including the Royal Air Force which used them in their World War II propeller-driven fighter planes. In 1952, the legendary Navitimer wrist chronograph, featuring a circular slide rule used to perform all navigation-related calculations, was launched. The Navitimer has been continuously manufactured for more than 60 years and is the world’s oldest mechanical chronograph still in production today. As commercial aviation boomed during the 1950s and 1960s, Breitling continued to play a key role, as its on-board chronographs became standard equipment in many airplane manufacturers and airline companies.